The tour now picks up along the famous Parkway, considered to be one of the world's most stunning highways. Now it is your turn to experience the beauty and vastness of the mountains. Interested in reading more about this scenic highway? It’s one of the world’s most spectacular journeys, slicing through mountains and glaciers on a ribbon of road that’s known as the Icefields Parkway. 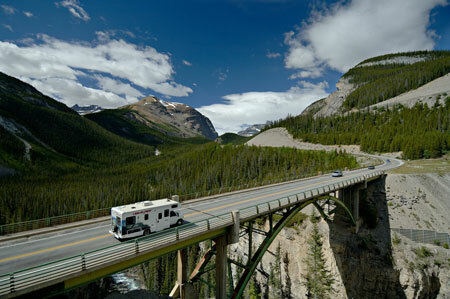 From Banff to Jasper, through two national parks, ride along the "backbone" of North America. Just a few kilometers up from the Highway Junction 93, the morning (nine or ten) is a good time to take photographs of the reflection of the Waputik Range on Herbert Lake. Just past the lake, there is a turnoff into the parking lot and picnic area where you can park your vehicle. Then you can take a stroll back along the east side of the lake and get that stunning photograph. Watch for traffic. Continuing north following alongside the Waputik Range you will pass Hector Lake in the distance to the west. It is the second largest lake in Banff National Park. This lake is not visited often as one has to ford the Bow River to get access to its shores. The name Hector was after Dr. James Hector of the Palliser Expedition of the late 1850’s. Continuing on northwards past Hector Lake you will find Bow Peak (2868 m/9410 ft), first ascended in 1896 by Walter Wilcox, an early mountain explorer. Beside Bow Peak is Crowfoot Mountain (3050 m/? 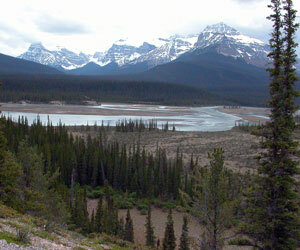 ft) from which Crowfoot Glacier flows. This glacier once had three toes making it look like a crow’s foot. One of the toes has since receded but it is still worth a picture stop. The mountain and glacier are of course named after the Blackfoot Chief, Crowfoot (1833?-1890). The next point of interest is breathtaking Bow Lake with the contrasting red-roofed Num-Ti-Jah Lodge. Num-Ti-Jah Lodge was first built in 1922 by Jimmy Simpson, a guide and outfitter. Jimmy expanded the lodge in 1937 and again in 1950 to its current size. The last time I stayed at the lodge, the rooms were still quite rustic (no phone or TV) but the restaurant meals were exquisite. So for those of you who may have the luxury of time, this may be a nice little place to spend some. If you are under time restraints, you can enjoy a quick coffee and buy a postcard at the gift shop. Non-guests are requested not to enter the main lodge. At the north end of the lake looking to the west, you can see the Bow Glacier which is a part of the Wapta Icefield and the source of the Bow River system. Bow Lake is frozen the better part of the year, and it is usually clear of ice by late June. There is a nice footpath that you can follow along the north shore of the lake. You will notice a beautiful blue turquoise colour of the waters. This is the result of Bow Lake being fed by Bow Glacier. Get back onto the Icefield Parkway Highway 93 heading north until you reach Bow Summit. Bow Summit is the highest point on the Icefield Parkway (2,068 m/6785 ft), and the watershed between the Bow and Mistaya Rivers. You are now entering into the Mistaya Valley. At Bow Summit there is a turnoff to the left to the Peyto Lake parking lots. The lower parking lots are for general public and the upper lots are designated for tour buses and handicapped only. Of all our mountain lakes, this is truly one of the most remarkable lakes and really worth making time for. As I used to always ask the passengers on my bus: was it the view of the lake or the walk that took your breath away? Please be prepared for shortness of breath on this 0.5 km (0.3 m) walk due to the high elevation of this beautiful viewpoint. By the way, can you see the outline of a particular mountain animal? This lake is named after legendary Bill Peyto, also known as Wild Bill, a comical and fascinating character who worked as an outfitter early in the last century. This trail is usually open from mid-June to late September but remember, there is always the possibility of snow!! You are in the mountains after all! For those that have the time and really enjoy wildflowers, June/July is the perfect time to take the Bow Summit Trail. Enjoy the Engelmann spruce and glacier lilies but remember to stay on the path because the vegetation is very fragile. Now returning to the highway, continue northbound. You will descend a very long and steep hill where you will come from the subalpine zone and move into the montane zone at the north end of the Mistaya Valley. As you approach the bottom of the hill, there is a small pullout on your left where you can view the Snowbird Glacier. Next stop – picture stop at Lower Waterfowl Lake. Gotta love that colour! Be careful as you cross the highway to get to the turnout. (The picture stop pullout is not the campground and picnic area. The turnout you are looking for is just north of this turnoff.) From this viewpoint you can take advantage of the beautiful views of Howse Peak (3290 m) and Mount Chephren (3266 m) across the lake. Now leaving the canyon, heading north you will cross the North Saskatchewan River. This spot was referred to as “The Crossing” by many early explorers as they desperately tried to find the best spot to cross the North Saskatchewan River. Just as you rise up the hill, there is a small picnic area to your left with a small walking trail which leads you to a panoramic view of the North Saskatchewan River Valley. There are some interpretive signs which talk about the early years and the time of the great Canadian fur trade. Highly recommended for photographs or just pure enjoyment! Just north of this picnic area you will pass the Junction to Highway 11 (David Thompson Highway), where you can find The Crossing at the base of Mount Wilson. Here, on the north side of the river, you have a restaurant, gift shop, fuel and accommodation at your disposal. Caution: prices tend to be a little higher in these remote locations! You are now in the North Saskatchewan River Valley and once again in the montane zone. As you travel northwards, keep your eyes open for all kinds of wildlife. I have seen wolves, black bears, grizzly bears and moose. On the west side of the highway, where the Alexandra and North Saskatchewan Rivers meet, are the Graveyard Flats. Once a popular camping location for early mountain travelers, this area was named after the many animal skeletons early explorer, writer and photographer Mary Schäffer found here due to the natives. Just north of the Graveyard Flats, on the east side of the highway, look high up into the mountains. Can you see any white spots moving? Mt. Coleman is a popular hang-out for the beautiful, white-coloured Mountain Goat. Their horns and hooves are black and they have a small white beard (not to be confused with the Bighorn Sheep, which are tan). Binoculars are useful, however, sometimes they are enticed by mineral licks and do come down the mountains. After Mt. Coleman is Cirrus Mountain (3270 m/ft). 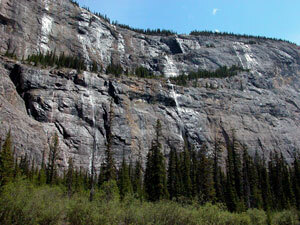 Melt waters flow through cracks in the mountain and reappear on the west-facing wall, thus the name Weeping Wall. In the late spring and summer the waterfalls are delicate and pretty. In the winter, the water freezes into massive sheets of ice and it becomes a favourite spot for ice-climbers. You are now approaching the Big Bend, a common place for Bighorn Sheep. They will come to the road in search of a lick, so please drive with caution. Now you are leaving the North Saskatchewan River Valley… but don’t miss out on one of the most dynamic views on the Parkway – the view of Cirrus Mountain to the south east (left) and Mt. Saskatchewan to the south west (right). Down the middle you have the North Saskatchewan River. Next for all of you who are crazy about waterfalls: the viewpoint for Bridal Veil Falls. Back on the parkway, soon you will reach the natural boundary between Banff and Jasper National Parks, Sunwapta Pass (2023 m/6637 ft)! You have made it to the Columbia Icefield, one of North America’s largest masses of glacial ice, covering 325 sq km/125 sq mi! The meltwaters that flow from the peak of Snow Dome flow into three different oceans: the Atlantic, the Artic and the Pacific. Snocoach ride onto the glacier. This is usually what people want to experience. Keep in mind, it takes about 90 minutes – you do get to venture off the snocoach to an area of the glacier deemed safe by your guide and as a result you can really experience what a glacial environment is like. I love to drink the water of ancient snowflakes – keeps me young! Bring as empty water bottle and wet your whistle! Do a guided ice walk on Athabasca Glacier. The guided interpretive hikes will show you a window into the world of glacier ice. The trained glacier guides will ensure that you are capable, properly outfitted and led safely across the glacier. Guided hikes are offered daily from June 1 to September 30. For more information and on hikes on the glacier visit Athabasca Glacier Icewalks at www.icewalks.com. Visit the interpretive centre on the lower level of the Icefield Centre. Go souvenir and postcard shopping at the gift shop located on the main level. Have a meal on the second floor at the Icefield Centre. Get more info from Parks Canada information desk on the main level. Check in at the main level for the Icefield Centre hotel! Located on the top floor of the Icefield Centre, this hotel has modest but comfortable rooms with amazing view of the Athabasca Glacier and surrounding mountains. From here you can either continue on north to Jasper or for those of you on the roundtrip tour, it is time to head back south to Banff. The highway then crests and decends down the north-west side of Mt Tangle. (You will notice that the road has literally been cut into the mountain.) The next pullout on the left (west side) is directly across from Tangle Falls. These falls are really worth the stop for any avid photographer. In the winter and early spring, Tangle Falls are ice falls – what a beautiful sight. The next pullout, again on your left, (west side) you can get a look at again another glacier from the Columbia Icefield – the hanging glacier known as the Stutfield Glacier as well as a beautiful view of the Sunwapta River Valley. The road continues down to the flats of the Sunwapta River where on occasion you can spot the endangered mountain caribou. April/May is a good time to observe these beautiful creatures which can be seen on the Canadian quarter. It is right here where you will come upon Beauty Creek Hostel nestled in the forest. Beautiful views of the Sunwapta River surrounded by the mountains. Continuing down the hill along the Sunwapta River, you will be able to see remnants of the original 1940 highway. Prior to 1940, the only way to travel through these mountains was on foot or horseback. Next up the road: Jonas Creek (with campground and youth hostel – nestled in the trees). Just a little north of Jonas Creek is Jonas Rockslide, caused by the force of glacial ice over time. You can get a true sense of the colours of these mountains by viewing the broken Gog quartzite rocks and boulders, so common here in the Rockies. For those of you who would like to go for a walk… there are remnants of the old highway you can use for a little stroll. Sunwapta Falls is our next stop. The Sunwapta Resort offers fresh baked goods, interesting souvenirs (fairly priced for a national park) as well as accommodation. The Falls can be reached by following the access road which leads to a parking lot. Follow the trail to the falls. You can watch the water as it drops with such power into the rock below. A real hit with kids! Next you will come upon a mineral lick which is a common gathering place for our mountain goats. Usually spotted through your car window as little white spots high up on the rocky cliffs of Mt. Kerkeslin (2950m), this is a real treat. This, the lookout to Mt Fryatt and Mt Christie, has a small parking lot if you would like to make a picture stop. 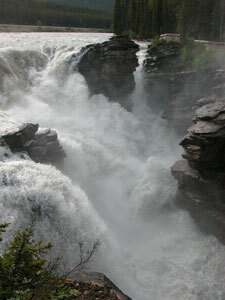 Just a few minutes north of the lookout is one of the major highlights of the Icefields Parkway: Athabasca Falls. Turn off at the junction for Highway 93A and Athabasca Falls to your left. Watch as the rushing waters are forced through small openings and over rock bridges cutting some of the hardest rock, again the Gog quartzite as seen earlier at the Jonas Rock Slide, and carving potholes in the limestone beneath. There are many little trails on both sides of the falls which can help you explore what the water left behind. The gorges and winding passages tell the tales of the past and you are left with your imagination as to where the falls will go in the future. 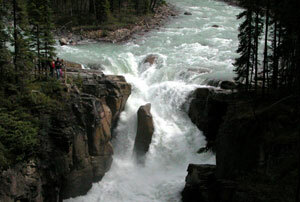 The highest water flow is in the spring and early summer – a spectacular sight! Mid to late August, as the water tends to settle, is a good time to see the beautiful green color the waters of the Rockies are famous for. Make sure you stay within the sectioned off areas. Please do not go beyond the railings at any spot, even if others have chosen to do so. The rock is wet and very slippery and many people have ventured out onto the rock for that spectacular shot, only to slip away into the cold rushing water, never to be found again. This is a favorite stop for most people, so allow enough time to gaze at the wonders of nature! Get back onto the Icefield Parkway and make your way to Jasper. 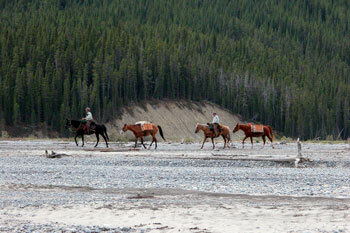 You will pass Whistlers Campground and slowly enter the Jasper townsite.